PhD in Telecommunication Technologies, Universidad Carlos III de Madrid, 1999 (with honors, University Award to the best PhD of the year in Telecom Technologies). MS Telecomunication Engineering (major in Electronics), Universitat Politecnica de Catalunya, 1994. Dr. Martínez-Ramon has served as an associate professor at the Universidad de Alcalá, Universidad Politécnica de Cartagena and Universidad Carlos III de Madrid. During the last 15 years, he has taught nearly 30 different graduate and undergraduate courses in Electronics, Electric Networks, Electromagnetics, Signal Processing, Telecommunications or Data Processing. Since 2004 he exclusively taught in English in bi-lingual engineering degree programs in Spain. Dr. Martínez-Ramón has served the Spanish university as associate provost for infra-structures and environment, associate dean of the Politecnic School (school of engineering) of Universidad Carlos III de Madrid, director of teaching management, and director of several degrees in telecommunications engineering. His research interests are in Machine Learning, where he has collaborated in numerous founded research projects in applications to signal processing, multimedia and speech processing, theory of decision and estimation, neuroimaging, and others. His over 70 peer-reviewed communications and journal papers are related to applications of Machine Learning to these areas of engineering. His current research is related to cognitive radio, smart grid, and neuroimaging. 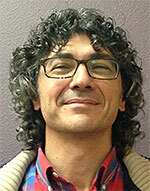 In 2003-2004, he did a post-doc in applications of Machine Learning to neuroimaging at the MIND Institute, UNM. Since then, he has actively collaborated with members of UNM faculty. He has participated as co-chair of several conference sessions and workshops. His spare time is spent introducing the wonders of amateur astronomy to his patient and beloved daughter. As a choral singer, he has participated in numerous classical and baroque concerts for Public Television of Spain, as well as a Handel concert at Carnegie Hall, New York.